Baby in carrier, stroller in hand, ready to board the train! Once your baby is big enough though, you may want to get a structured carrier for your and their comfort. But which carrier should you get? There are many of them on the market and we personally have tried 2 different ones: Ergobaby Original Baby Carrier and the LILLEbaby Complete Baby Carrier . Getting squirmy toddler through airport security. When our first child was born there was only one company that made "ergonomic" carriers, i.e. ones that were comfortable for the parents. They called themselves "Ergobaby" (get it? get it?). We got one and it was great. 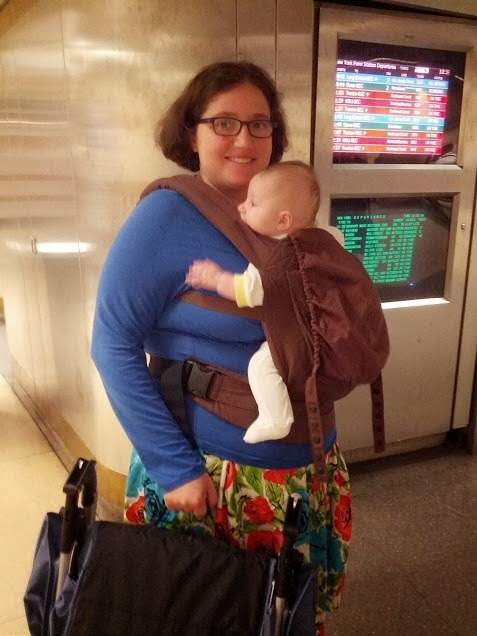 It was an easy way to transport the baby, say onto an Amtrak train, and still have hands free for all your stuff. It had a "sun hood", which was great not just to protect the baby from the sun but also to help her sleep when we needed her to nap on the go. It also had a pocket in the front which was a convenient place to store your cell phone/keys etc. if you were just taking a walk around the neighborhood and didn't need that much stuff with you. Our baby also just enjoyed hanging out in it while we did other stuff and often it was a way to get her to nap when she just plain didn't want to. We used it with some frequency until the kid was about a year old. In fact we have so many pictures of us carrying her around in it (in the carrier at a wedding! at a train station! with dad working at a computer! ), it was hard to just pick 2. 1. There was no front facing option with the "original" carrier, which was the only one available at the time. Facing forward would have been much more fun for the kid once she got to be about 4 months old. 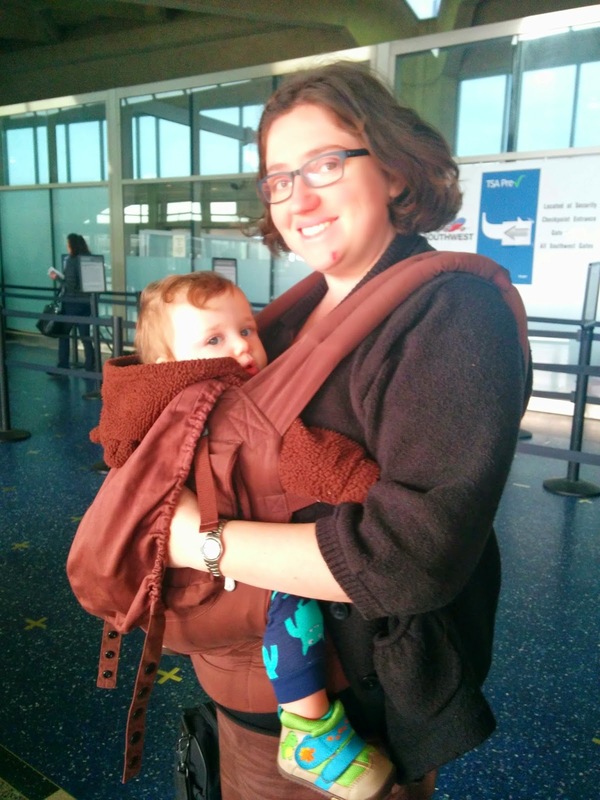 Both Ergobaby and other brands have since come out with structured carriers that have this feature. 2. When the baby is under 3 months, you have to use this really bulky and hot insert with them. This one was the real bummer, especially since our first baby was born in June and our second in July. Even in the most recent version of this (the Ergo Baby 4 Position 360 Carrier ) they haven't entirely fixed it (the 360 infant insert at least does appear to be thinner). Given that other options are available, if you think you'll want to use the carrier before the kid is 3 months, I would say it's definitely worth considering a different brand. When we found out we were expecting a second child, we knew we wouldn't have to get too many new things for him. He was born a mere 2 years after the first and most things survived our daughters' use of them. There were a couple of products, however, we wanted an updated version of and the structured carrier was one of them. For this reason we set out to find a carrier that improved on the 2 things mentioned above that we didn't entirely love about the Ergobaby . The LILLEbaby Complete Baby Carrier met all our needs in spec and has certainly lived up to expectations since then in use. It's appropriate for use in the newborn stage without any inserts. 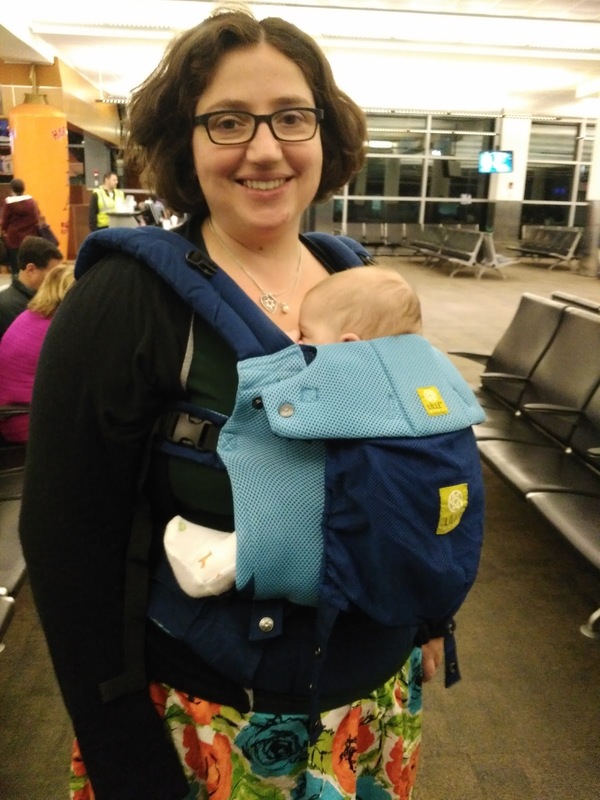 Like the Ergobaby, it has a pocket for transporting small things like a cell phone or a burp cloth. It also boasts not only a sun hood, but a back that can be pinned down to give the baby a better view of the world even when the baby is worn parent-facing. Not only that, but it can be converted to be forward facing relatively easily. Most importantly, it is phenomenally comfortable for the parent (even more so than the Ergobaby). It's a bit tricky to learn to put on but, the other amazing features of this are well worth it in my opinion. Finally, what I love about this carrier is that it comes both in a "all season " and "airflow" version. We got the "airflow" version because wearing a baby usually feels warm and one can always add a cover to it. This carrier has been everything it promised to be and I am super excited to be using it until the kiddo outgrows it. General theory- Carriers are super useful in the first year of life, especially if you live in an urban area and like to go places not in a car. 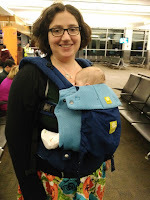 In the first 2 months of life I really recommend an unstructured carrier (doubly for Mom). You can see our review of the Moby and Infantino Mai Tai. Once your baby is big enough though, you may want to get a structured carrier for your and their comfort. When our first was born there was only one company that made "ergonomic" carriers, i.e. ones that were comfortable for the parents. They called themselves "ergo" (get it?). We got one and it was great. It was an easy way to transport the baby, say onto an Amtrak train, and still have hands free for all your stuff. It also had a "sun hood", which was great not just to protect the baby from the sun but also to help her sleep when we needed her to nap on the go. It also had a pocket in the front which was a convenient place to store your cell phone/keys etc. if you were just taking a walk around the neighborhood and didn't need that much stuff with you. Our baby also just enjoyed hanging out in it while we did other stuff and often it was a way to get her to nap when she just plain didn't want to. We used it with some frequency until the kid was about a year old. In fact we have so many pictures of us carrying her around in it (in the carrier at a wedding! at a train station! with dad working at a computer! ), it was hard to just pick 2. 1. There was no front facing option with the "original" carrier, which was the only one available at the time. Facing forward would have been much more fun for the kid once she got to be about 4 months old. Both Ergo and other brands have since come out with structured carriers that have this feature. 2. When the baby is under 3 months, you have to use this really bulky and hot insert with them. This one was the real bummer, especially since our first baby was born in June and our second in July. Even in the most recent version of this ("the 360") they haven't fixed it. 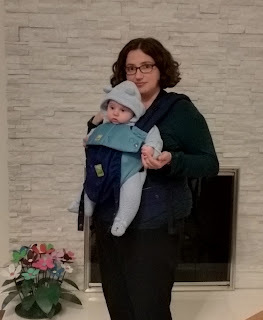 Given that other options are available, if you think you'll want to use the carrier before the kid is 3 months, I would say it's definitely worth considering a different brand.